Salad or other fresh vegetables should always be present in our meals. Sometimes it’s useful to prepare them as our main course and if we are hungry, they can be accompanied by a small piece of cheese or lean ham. 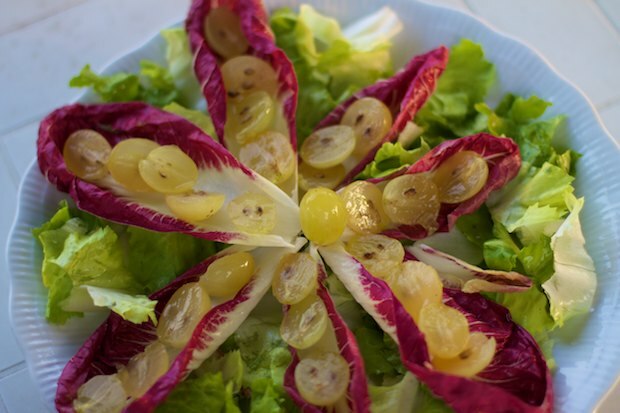 The combination of vegetables and fruit in this salad is interesting and because of this, our families will feel like this is a complete dish, not the usual side salad. The red radicchio you see represented in the photo is an early stage Treviso radicchio. This type of radicchio is tied to a particular area of Italy. It can be replaced by the common red radicchio that is readily available. Wash the radicchio, escarole, grapes, and small onion and dry with a cloth. In a large bowl, tear the escarole and radicchio with your hands then halve the grapes and pour them over the vegetables. In a small bowl, add the onion that has been cut into thin rounds, and if you want, a sweet chili pepper. Add the olive oil, mustard, and salt, then emulsify it with a fork and pour it over the vegetables. 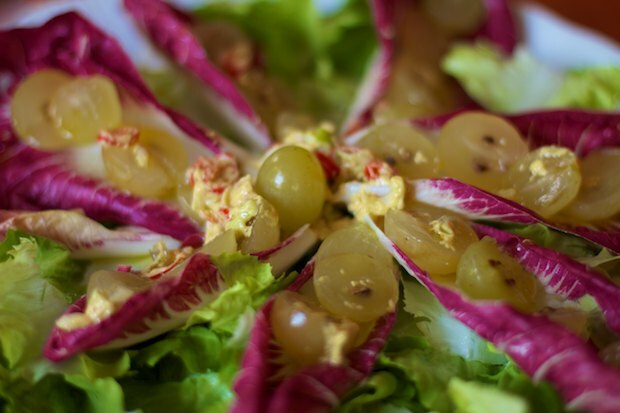 Posted in Recipes, Salads and tagged with Insalata Settembrina, September Salad. RSS 2.0 feed.